Note: This is only a Translation!!! !! !This is only a english translation!!! 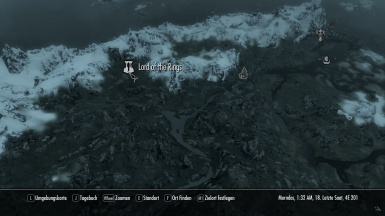 After a long time, my first Skyrim mod is finally finished. I think it is well worth seeing for any Lord of the Rings fan. Initially, I have created three new areas of Middle Earth. 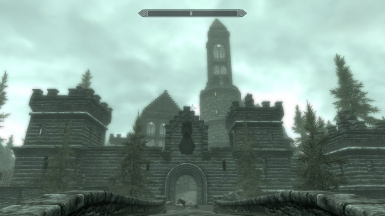 Once you have discovered the dragonsreach in Whiterun, you can travel to the east of Skyrim to new locations. The world choice allows the player to travel directly into the respective territories he wishes to enter. The areas themselves are also connected internally. The Mines of Moria can be entered from the west side of the Misty Mountains through the Hollin Gate. The mine itself is divided into smaller areas such as the lower depths or Khazad Dum. The Golden Forest Lothlorien is entered centrally. 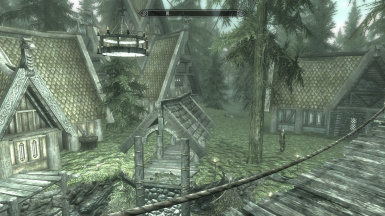 The west side includes the treeline and an Orc camp. 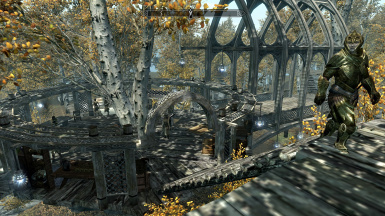 The eastern half of the forest has the capital city of Caras Galadhon. The Dark forest on the banks of the Anduin. There is also a small outpost of Elves. In the Northern part of the forest there is a spider cave, and far to the east rises the fortress of Dol Guldur. The elves besiege this fortress, but evil has awakened within it and has been waiting for a worthy opponent. Apart from the detailed areas, I also added materials for crafting. In the Mines of Moria, Mithril is everywhere. If you have enough of it, you can forge a sword and a shirt in the great forge of Khazad Dum. The shirt is worn under regular armor, but it offers both armor and enchantment bonuses. In Lothlorien, specifically in Caras Galadhon, you can discover a market and a barracks. Here the player can trade and improve his fighting skills with the Elves. 3. Next, in the console, type "moveto player" and your companion should appear next to you after closing the console . I will continue working to expand my knowledge of the Creation Kit. Future projects I am considering are Bree, Rivendell, Weathertop, Eregion, Rohan, Misty Mountains, Mordor, and some others. These will hopefully start to appear in subsequent versions of this mod. At present I can think of only one thing. 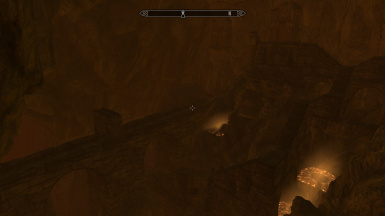 In the main quest, you are sent to the cave of Septimus. Unfortunately the cave ceiling is missing. I will try to add it in a later version. Otherwise, there should be few problems with this mod. I am not aware of any compatibility issues with other mods. Should a problem occur, leave a comment.